All grass fields are off-limits until further notice. Public Works will let us know when they are playable. Thank you for your cooperation! Join us starting Monda,y April 22 – May 13th from 6:00 – 8:00 pm at the MS gym. 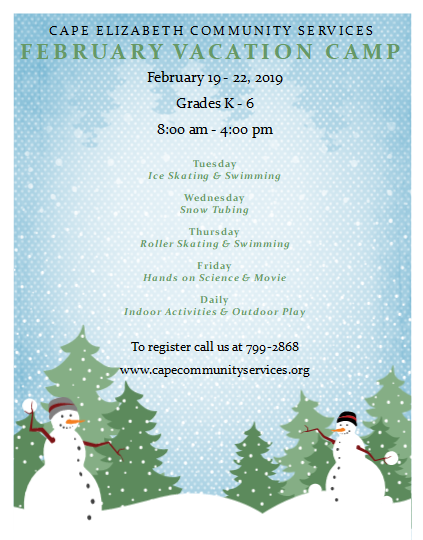 The following are additional Spring/Summer Programs that were not included in the Cape Explorer. FMI or to register, click on the program link. Unfortunately, the Spring/Summer issue of the Cape Explorer was delayed in getting to the post office. You should receive your copy in the next week or so. Fortunately, the publication is available for viewing/printing online at our web site. Registration will open online on Sunday, March 24th at 8:00 pm and in person or over the phone on Monday, March 25th at 8:00 am. If you want a jump on upcoming programs being offered, the Spring Summer Cape Explorer is now available on our web site for viewing. Registration Opens Online March 24th at 8:00 pm. In person March 25th at 8:00 am. Happy Exploring! Seeking part-time, seasonal staff to greet visitors, commercial vehicle drivers and tour guides at Fort Williams Park in Cape Elizabeth. Daily duties include confirm reservations, collect user fees and assist with parking directions within the park as well as provide area information. If you are outgoing and knowledgeable about Greater Portland, comfortable engaging with people, and able to work independently with small team of reliable and flexible fellow greeters, we need you! Must be available to work both weekdays and weekends May through October. Apply now if you’d like Fort Williams Park to be your new office. All afternoon & evening programs beginning at 4:00 pm or later will be held as scheduled. All Adult classes for Wednesday, January 9th, 2019 are on as scheduled.